Ritual Kontakts is a sound library for Native Instruments Kontakt. Ritual Kontakts features a complete range of sounds to build your own ritual music: ethnic percussions and drums, strings, didgeridoos, singing bowls, rainmakers, nature SFX and synthesized hypnotic sounds. The aim of this library is not to provide you every conceivable instrument on Earth, but to give you an environment to experiment and to transorm any sound into your own one. Play with the many effects (all of them fully automatable) already featured within every patch and create your signature sound with a few spin of knobs. You will never end with a “preset sound”, but rather with a variation that is truly unique. Ritual Kontakts will please a very diverse audience: soundtrack composers, ambient musicians, sound designers, devoted to ethnic music and every artist willing to add a touch of eerie feeling to his/her music. • 27 patches for Kontakt: acoustic instruments, chromatic percussions, ethnic drums, exotic soundscapes, a wide drum kit and many more. Every patch features different variations of the same sounds. By combining them you can obtain dozens of new timbres. 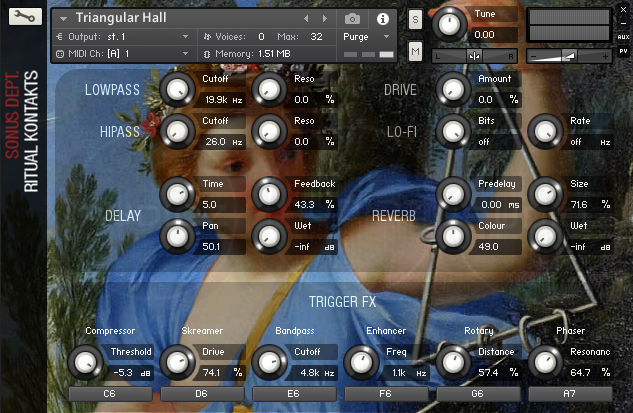 • All the patches have a vast range of effects, some triggerable directly from your keyboard, including: filters, delay, reverb, phaser, compressor, distorsions and spatial effects. You won’t need any additional effects to obtain the exact sound you are looking for. 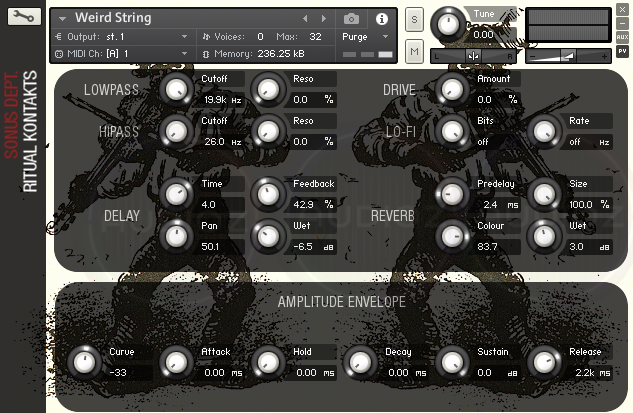 • Every parameter is fully automatable, you can create evolving and realistic sounds in a breeze. • Everything you hear was sampled or rendered at 96kHz/24-Bits. You will notice the pristine quality of every single sound. • Every patch has its own GUI, carefully crafted and oriented towards usability and beauty (see below for some screenshots). • Requirements: Native Instruments Kontakt 5.6+ or higher.